Gov. Phil Scott on Wednesday appointed two new members to the Green Mountain Care Board, the body that oversees the health care industry in Vermont. The governor tapped Sen. Kevin Mullin (R-Rutland) to serve as the board’s chair and veteran financial executive Maureen Usifer to a second vacancy. Both appointments are effective immediately. The GMCB had been struggling since early January to conduct its business with only three of five seats filled. The board could only hold meetings if all three were in attendance, and a unanimous vote was required to approve most items. Last week, the board put off action on a proposed surgical center in Colchester because it could not attain unanimity. Scott noted during a Montpelier press conference Wednesday that he had heard “the cries for help from the board last week” and made his selections as quickly as possible. The process had been delayed because at the end of last year there was a significant turnover on the nominating committee that recommends applicants to the governor. Mullin himself was a member of that committee until his term expired in December. Mullin replaces Al Gobeille, who resigned in early January to become secretary of the state Agency of Human Services. Mullin served for 15 years in the Senate and four years in the House before that. He is also president of Glenwood Movieplex, which operates a small chain of movie theaters. Mullin said he applied for both board vacancies soon after they were created. His was one of nearly “four dozen applications for the two positions,” he said. The Vermont Press Bureau first reported news of Mullin’s appointment late Tuesday. As for replacing Mullin in the Senate, Scott told reporters he had not given any attention to the matter but hopes to name a replacement before the legislature’s scheduled veto session on June 21 and June 22. The Rutland County Republican Committee can choose up to three nominees to be submitted to the governor, who will make the final selection. 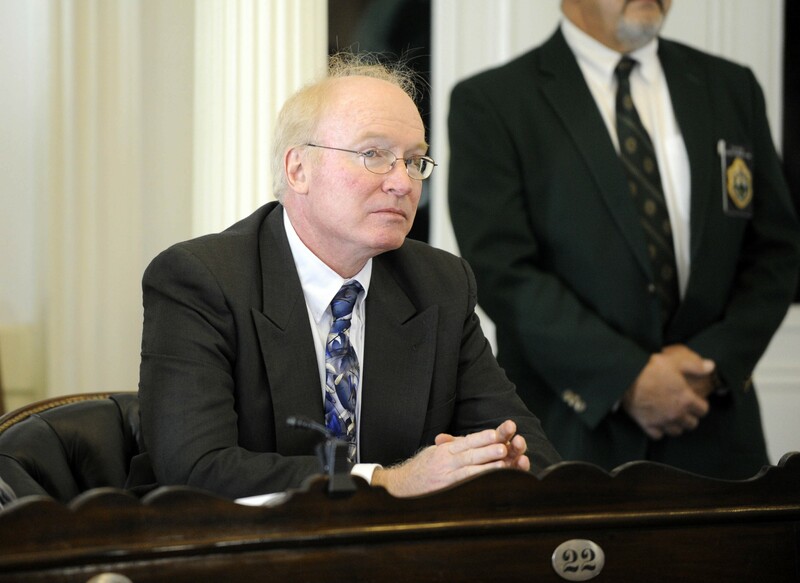 Unbidden, Mullin threw out a couple of names: former representative Jim McNeil, who served in the House from 2009 to 2013, and Dave Soucy of Green Mountain National Golf Course, who was a finalist for a House vacancy created by the April resignation of Mendon representative Job Tate. Scott chose former lobbyist Jim Harrison to fill that seat. Maureen Usifer has spent more than three decades in financial management. She’s a former chief financial officer for Seventh Generation and is now a director of BlackRock Capital Investment Corporation. She replaces Betty Rambur, who resigned from the GMCB in January because she was moving out of state. Scott cited the two appointees’ experience in business and finance as key. The GMCB is responsible for rate setting for health insurers and hospitals, as well as decision making about the structure of an industry that accounts for nearly 20 percent of the Vermont economy.